Personal Sports Blog of Brendan Cole. The name comes from ESPN Radio's Mike and Mike Stone Cold Lead Pipe Locks with a personal touch. All opinions are my own. 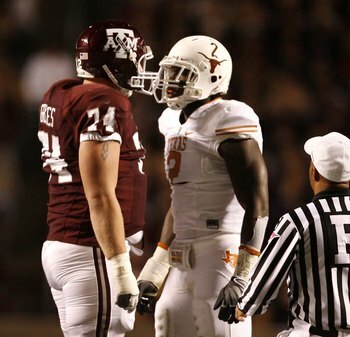 Another under-appreciated rivalry, "The Lone Star Showdown" between the Longhorns and the Aggies are the two biggest and oldest public universities in the state of Texas. The rivalry has a special uniqueness to it considering Texas was the general, open public university in the state while Texas A&M is still very much aligned to its military-based roots. The line between Longhorn and Aggie is a clear marker in the state reaching back to 1894 with the Longhorns leading the all-time series 76-36-5. 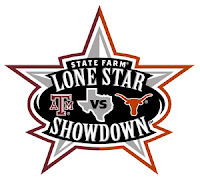 Since 2004, the series (including all aports) has been known as the State Farm Lone Star Showdown with the series being titled the Lone Star showdown as early as 1996. 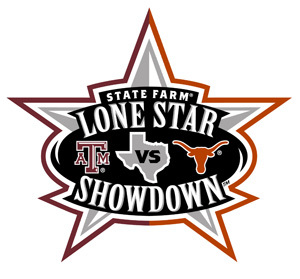 Part of the Lone Star Showdown, the Longhorns and Aggies vie each year for the coveted and aptly-named Lone Star Showdown Trophy. This competition includes all sports and was essentially designed to recognize, or give some recognition to, the non-mainstream sports—which likely means sports other than football or basketball. The seventh oldest rivalry in college football goes back to 1894. The two sides played for the Platypus Trophy until 1961 before it was lost and recovered in 2005. From 1997 to 2006, the winner alternated by who wore the home uniforms. The Ducks lead the all-time series 58-46-10. Basketball- The men's basketball rivalry is one of the most contested games between any two teams in the nation, with an NCAA record 331 games played as of the end of the 2009 season. 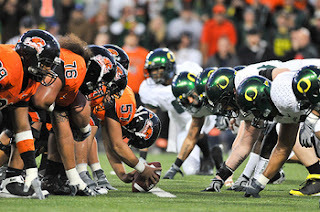 The Beavers also hold the NCAA record for most wins against a single team (the Ducks) with the series' 183-150 record. The all-time record baseball record between the schools stands at 155-147 in favor of Oregon State. The 2005 and 2006 seasons saw a rare unity between the schools in rooting for the Oregon State baseball team during the 2005 and 2006 College World Series. The Beavers went two-and-out (i.e., lost their first two games in the double-elimination event) in 2005, but won the national title in 2006 and 2007. 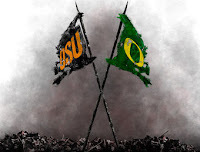 With the recent success of the Oregon State Baseball program, the University of Oregon reinstated their baseball program in 2009, renewing the rivalry. 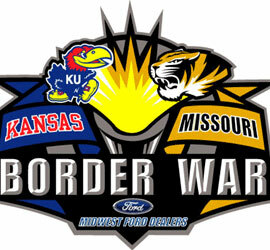 "The Border War" is the closest rivalry of them all. It's so close in fact that the series record is disputed depending on which sideline you find yourself. Although 56–54–9 for MU is the often stated series result, there is an ongoing dispute about whether the 1960 game should have been counted as a win for Kansas, making the series a tie at 55–55–9. The Big 8 retroactively forfeited the win to Missouri due to Kansas player Bert Coan being voted ineligible following the 1960 season. The record books of the University of Kansas, and the NCAA, state the record as a win for Kansas, fueling the controversy. Several other publications have referenced the series record more to the favor of Kansas due to the NCAA official record books record of the game as well as Kansas actually winning the game on the field. 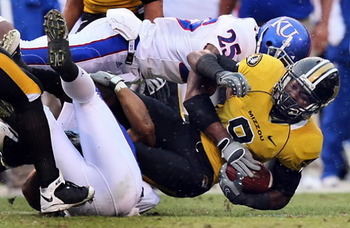 Kansas and Missouri own the second-longest running on-field rivalry having first met on Halloween 1891. The hardwood version of the "Border War" began in 1907 and, since that time, the teams have played over 260 times. The Jayhawks have a decided advantage over the long haul 171-94 and have taken eight of the last nine. In Baseball, Missouri leads 212-123-2 or Missouri leads 195-124-2 (disputed). MU currently leads the baseball series, although the series history is disputed by the two schools. The KU media guide shows that the first game played between the two schools was in 1899, while the first recorded game in the MU media guide was in 1901 (the MU guide lists the entire 1899 season as "unknown"). The Kansas media guide lists the series with MU ahead 195-121-2 while the Missouri media guide lists the tigers ahead 212-123-2. 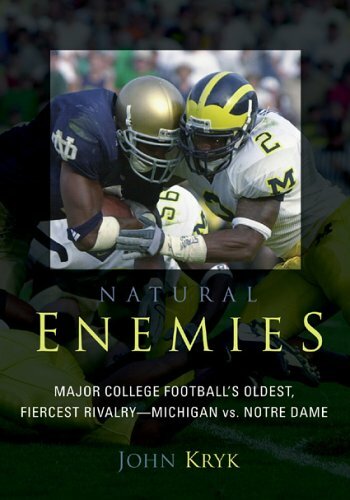 Michigan and Notre Dame have not played as many games as other rivalries on this list, but they are two of the nation's most historic programs who have rejuvenated a game that started in 1887. Michigan football and Notre Dame football are considered to be among the most elite college programs. 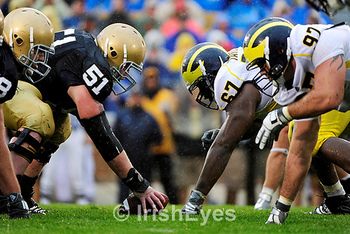 Michigan and Notre Dame respectively rank #1 and #2 in winning percentage and #1 and #3 in all time wins. The rivalry is heightened by the two schools' competition for all-time win percentage, which each has held during their history, as well as national championships, with each school claiming 11. Fierce competition for the same type of student-athletes as well as disputes over Notre Dame's potential conference membership in the Big Ten conference also serve to fuel the rivalry. The series took a 35-year break from World War II until 1978, but since then the two rediscovered ancient tensions. The rivalry gets added juice from Notre Dame's continuous flirtations regarding Big Ten expansion. The two teams will play the 2011 version of the game at night titling the game “Under the Lights.” Both teams will wear retro “Legacy” uniforms designed by Adidas. The game will be the first game played at the Big House at night. Currently, Michigan leads the all-time series 22-15-1; since the 1978 renewal, the two teams are 13-13-1. The Big Game has been played since 1892 in an battle for bragging rights of Northern California. The two sides have played for the Stanford Axe since 1933 with Stanford leading the all-time series 56–46–11. 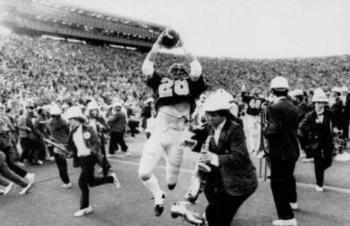 Of course, the rivalry was made famous nationwide for "The Play" during the 1982 edition. The basketball game may take some time to really pick up, but the script is a good one, as former Stanford coach Mike Montgomery now hangs his hat at Cal and there is some animosity there. Montgomery hopes to rebuild Cal the way he did at Stanford before things went south, while Johnny Dawkins is just getting started there. Although there may not be any real sparks yet, this one could play out nicely for the Pac-10.